For the first time in her three years, Qing Qing is finally sleeping (In her PJs at right). A series of infections over the past six months delayed her critical heart surgery. Once during this wait, her heart just gave out - Quin Quin nearly died. But finally last week, little Quin Quin was strong enough to have the first of the two operations she needs. Since the day she was delivered to the orphanage, her blue colored skin told the caregivers that this little girl was not getting enough oxygen. The lack of oxygen was created by a severe heart condition that made everything difficult for the orphaned baby, even falling asleep. Our friends at Candy Craze provided 200 Indian children with blankets to hold off the chill of winter nights. All those kids also had a hot meal the evening they received their blankets. In addition, the purchases of Candy Craze Take-out boxes paid for two mobile medical clinics to impoverished villages so that 150 patients could receive free medical treatment. 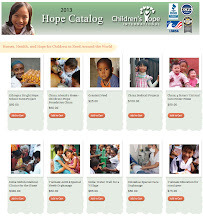 2010 Gift Catalog makes it possible for you to help these Indian children. For years, the 2100 students at Bright Hope School went all day with no fresh water to drink: Yesterday that all changed. Water came flowing out of the ground as the drilling rig hit drinkable water at 80 meters below the school property. “The Bright Hope director was crying in joy when she saw water coming out from the ground”, said Tsegay Fesseha, Children’s Hope-Ethiopia Director. Enjoying this much anticipated moment, were the members of a work detail from Harvest Church of Billings Montana. The Harvest team is at Bright Hope this week reconstructing the front gate wall that leads into the school grounds. Bright Hope community volunteers are assisting with this tough manual labor needed in order to complete the job by the end of the week. The well is the first project of the Bright Hope School Garden Project. With water soon to be available, the chicken hatchery buildings and the vegetable garden cultivation can begin. This self sustaining mini-farm will provide nutritious meals of protein and vegetables for the students who all come from impoverished homes. On the last day of the three week trip exploring the projects made possible by the gifts from friends of Children's Hope, I spent a little time at Alenah's Home in Beijing for orphans who recently received surgery. For six months to a year, or even longer, these orphans have a place to recover. A new larger location is being rehabbed as I type, a temporary home for around 30 children. 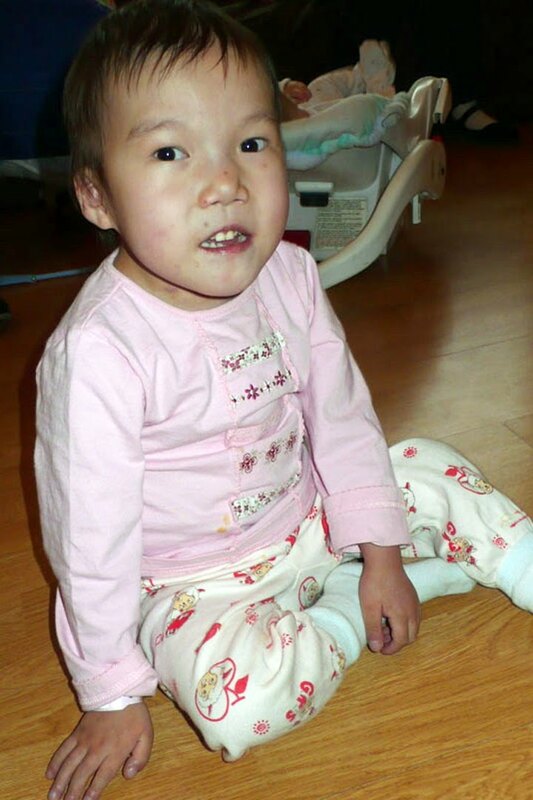 Please consider giving to the operation of the CHI Beijing- Alenah's Home. These are great kids who need time to heal. Sometimes I cringed and sometimes I laughed while listening to earthquake survival stories from my dinner companions last night. 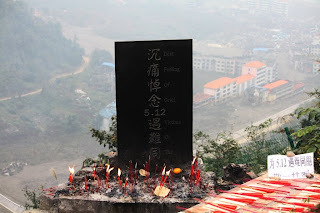 Almost 18 months removed from the May 12, 2008 earthquake, residents of Sichuan province all have a story. One 60-year-old man, who admits he was frightened beyond belief, explained how the earth flowed like water below him. Worried in his fear that the ground would open up to swallow him, he chuckled as he recalled his attempts to grab the trunk of a tree, only to miss every time he reached out because the tree was moving so violently side to side. Today it was only solemn disbelief as I looked from atop a mountainside lookout at the tomb of 30,000 people of Old Beichuan. While much of the rubble in the region west of Mianyang has been cleared and many families are now back in newly constructed homes, the government lets Old Beichuan sit as it did after the shaking from the 8.0 earthquake ended. It will stay as rubble in honor of all who are buried below it. A museum to honor all 80,000+ who died throughout Sichuan Province will also be erected next to the destroyed city. Some six miles east, down the canyon, 50 cranes reach above the new apartment buildings being constructed for the new Old Beichuan. This will be home for the 70,000 residents who survived. Children's Hope counselors are working to bring hope to surviving children and their families in the relocation camps. In seven Hope Centers throughout the earthquake affected region, earthquake orphans or children with one surviving parent have been given a shoulder to cry on and loving support for over a year. With a two hour flight west of Beijing early this morning, I was on time for lunch with a bunch of great kids at a Buddhist run orphanage. In this remote location south of Mianyang, the children are getting an excellent education by four retired school teachers. Several kids from this orphanage have gone on to universities. We worked off our lunch with several rounds of ping pong. After an hour long drive back to the north of Mianyang, I met a little girl whose chance at ever walking may depend on us. 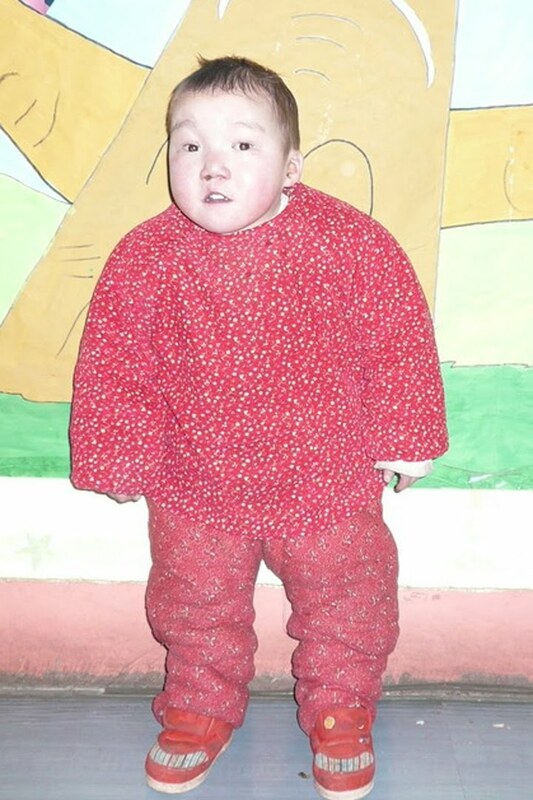 This little 18-month-old orphan has severe club feet that need immediate attention. Because of the complexity of the surgeries, the Chinese government may not pay for the procedures. She'll have to be taken from Mianyang to a orthopedic specialist hospital in Beijing in order for this to be properly repaired. I will keep you up on the status of her surgery options. 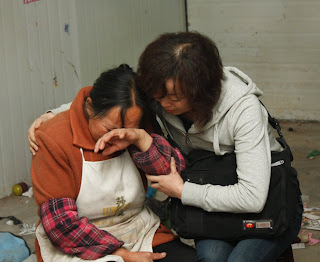 Tomorrow I will visit one of the CHI - Hope Centers in the area near Mianyang that was devastated by the 2008 earthquake. From the narrow, crowded roads of Kakinada, India, I finally arrived to the broad streets of Beijing: Home of 16 million people and 4 million cars. With that many cars, it doesn't matter how wide the roads are, they get just as packed as the roads in Kakinada. Although many of the cities of China are now huge modern metro regions, there are still numerous issues that Children's Hope is attacking for China's orphans and children from impoverished homes. Today at a Beijing Hospital, that regularly performs some of the more complex surgeries for Children's Hope cases, I met Yun Lian, from an orphanage in Yunchen. She was brought to Beijing for a possible surgery to correct a previous operation on her Spina Bifida, first performed at a county hospital near her orphanage seven years ago. 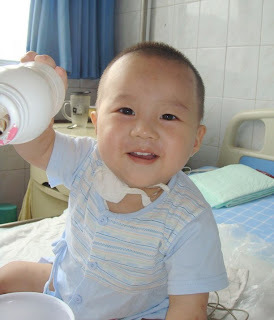 Over 450 surgeries for Chinese children have been completed in 2009 because of your great support. Many of these were life-saving heart surgeries. Some are life-changing like Yun Lian's. In the northern reaches of Beijing, I went to the ErKang Hospital to see a program that is changing the lives of children born with Cerebral Palsy. Through this program, the parents of children with CP are learning the therapy they need to administer so their children will have better range of motion. One 14-year-old, who had never walked prior to the program, is now rambling down the halls of the hospital with a big smile on his face. For many of the poor rural families who have one of the three million Chinese children with CP, therapy is not available in their area and they can't afford it even if it was. So this program houses the parents and the children at the hospital so the child can receive therapy and the parents can, at the same time, learn how to perform the therapy techniques back at home. The length of stay is determined by the severity of the child's CP. It was heart warming to hear about the numerous children who, with only the beginnings of therapy, are making great progress. I finished my last full day in India at the rice farming village of Siripurum. 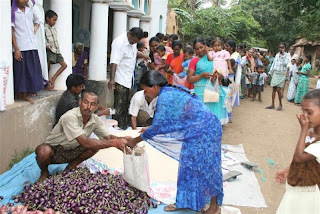 The village elders gathered around 200 women, with young children, to receive fresh produce and rice. 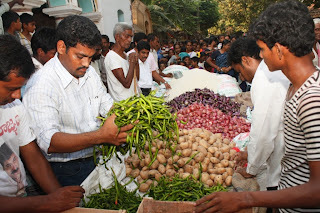 The Children's Hope partners in India distributed hundreds of pounds of rice, potatoes, tomatoes, onions and green peppers. This program helps these families with added nutrition as they hold on for the rice harvest in December. It costs over $500 each time Mission to The Nations runs this rice and produce giving project. The several feeding projects I witnessed serving the warm Upma, runs around $30. The joy in the eyes of those who are receiving this food is priceless. Today I had the thrill to see our donor's gifts give added health to an entire community. 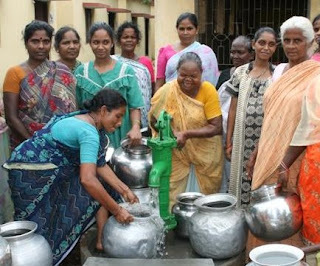 As you can see in the video, village women were filling their stainless steel water pots with clean fresh safe drinking water. The well was bored a few months ago but the families are thrilled to see water borne illnesses being eliminated from their community. In contrast I shot video at a nearby village that does not have a well. The villagers were carrying their pots to the local muddy pond, shared with water buffalo, to get their day's water for cooking, bathing and cleaning clothes. These shallow wells are a miracle to the people who have access and it's almost a miracle that one can be bored for $650. After last evenings feeding program at a fishing village north of Kakinada, our partners in India, Mission to the Nations, kept me busy all day today. We first went to visit two of the 15 schools run for the 7000 children, from impoverished homes, who would not receive an education without this opportunity. Many donors have given in the past year to supply these children with books, notebooks and slates. Also, a number of these children are in the sponsorship program so their uniforms and funding for their education is provided. 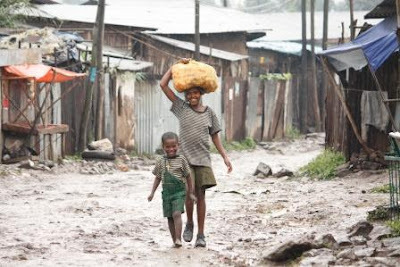 The homes these children come from are extremely impoverished. I saw their neighborhoods when we visited the New Life orphanage and when the MTN staff held a mobile medical clinic for 150 people this evening. The poorest of the poor in this area are fishing families. Those are the ones you see in line with their children to be examined by the doctor. 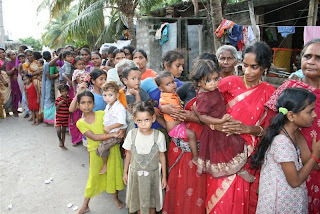 A day out in the Bay of Bengal, on most days, does not provide much more than food for these families. On a good day, the fishermen can sell some of their catch. On a bad day, the children don’t eat. Even those good days don’t provide much. These are photos of some of the 7000 children from impoverished homes in Kakinada, India, who receive a free education to help lift them out of poverty. The Ethiopian kids at Bright Hope School are wonderfully fun loving despite their living conditions. 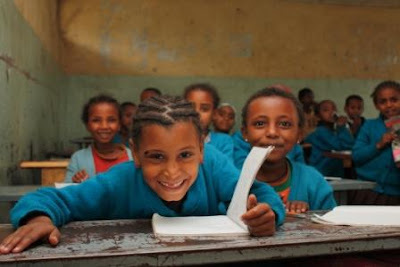 Using felt pens and makers, Mengstu makes all the instructional visual aids for Bright Hope (Biruh Tesfa) School. Maps of the world, periodic tables, biology models and alphabet quiz cards all originate in Mengstu’s studio. Exceptional staff and teachers at Bright Hope are doing all they can to help lift the 2100 students kids out of a desperate life style. 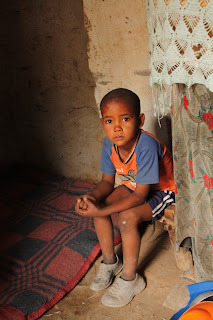 The hunger from a lack of nutritional foods and fresh water hinder the children’s education. The Bright Hope Garden Project is a group of churches, organizations and individuals coming together to help build a self sustaining mini-farm at the school. At completion the children will be provided safe drinking water and protein in their diet from chickens and eggs as well as vitamin packed vegetables. 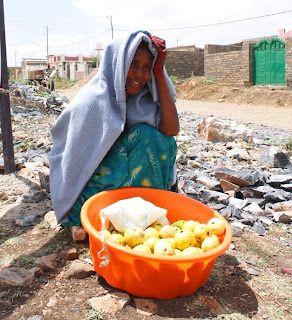 Berhan Yohannce sells apples by the side of the rocky road down from her house. Her husband died from AIDS leaving her with no support to raise her two children. 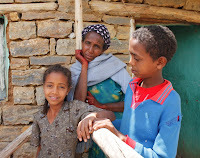 Now Berhan’s 11-year old daughter, Mehret, has developed a malady that is attacking the muscles in her left leg. Walking is becoming more and more difficult. Doctors in Mekele, Ethiopia tell Berhan that successful treatment is only possible if she takes her daughter to a hospital in Addis Ababa. Living on the income from selling apples will not provide near enough for the two day bus trip and lodging in the capital city, let alone the hospital examination and treatment. Let’s make sure Mehret can walk and run again. The kids of Bright Hope lifted my heart today. Class after class that I visited was so welcoming and respectful. Two of the classes sang songs to me with such gusto; their combined voices buried my video camera’s audio meter. (I hope to show you part of that video as soon as I travel away from dial-up internet). The reality of their lives, however, broke my heart. 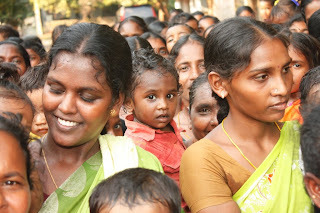 These 2100 children come from a community that grew up around a leprosy hospital. 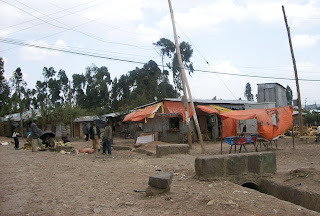 For decades families suffering from leprosy have immigrated from all over Ethiopia to this slum, on the western edge of Addis Ababa, to seek treatment. Many of the children don’t even get one meal a day. Some even head to the nearby dump at lunch time to scavenge for a scrap of food. The Bright Hope School Garden project will give these kids a chance. They are already receiving a fabulous education but hungry tummies have a hard time learning. The garden and chicken hatchery will provide these kids with at least one highly nutritious meal of protein and vegetables everyday. The well will give them water to drink at school and at home. After what I saw today, I can not implore you enough to help finalize the Bright Hope Garden Project. After 22 hours of travel, the 130 soccer uniforms and I landed in Addis Ababa. There was one last hurdle - customs approval. When the customs agent opened one of my bags, she gave me the “who are you kidding” look. The uniforms were just too new and beautiful for her to believe it was a donation for a church ministry. I pointed out that the jerseys had “Tinely Park Soccer” screen printed on them, in an effort to show her that all though these uniforms have never been used, they don’t have a U.S. resell value. After a couple of supervisors got involved, it appeared I would have to store the uniforms at customs until I could return with an official letter stating the use of this donation from our office in Ethiopia. They would not accept my letter signed and notarized by Children’s Hope in St. Louis. I had spotted Tsegay, our CHI-Ethiopia director, waiting for me just outside the secure area. They allowed him to come in and explain the situation. 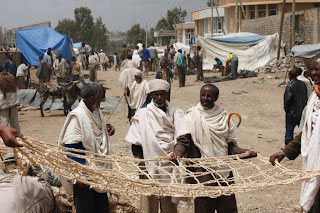 Again they stated that the donors should given a monetary gift so that we could purchase from Ethiopian craftsman. We all agreed on that, but this is a donation that will do wonders to enhance the Wondimamchoch church outreach to street children. After some more delays, the original customs agent came over to Tsegay and I and said, "Next time you need all the correct letters, but with this donation, I will let you go." So off we went with all the uniforms! 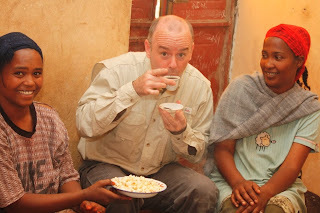 We received grace at the very beginning of the trip to Ethiopia. 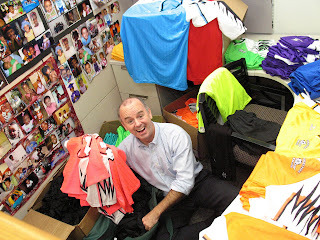 As I lugged my three duffel bags up to the check-in window, I immediately hit a snag with the 130 soccer uniforms making it to the street kids in Ethiopia. The check-in agent would not accept my notarized letter stating that the extra luggage was for humanitarian purposes. In order to add one bag to my allotted two bags, the agent told me matter-of-factly, that without an official corporate letter, I must pay $250.I was willing to do that but I was greatly disappointed. She seemed to instantly soften while she came up with a plan for me. She said she would let me on with two overweight bags, if I could combine all three bags into two bags 70 pounds or less each. My wife and I quickly extracted the vacuum packed jerseys, shorts and socks from one bag and wedged them on top of the uniforms (and my clothes) in the other two bags. We did it! Two overstuffed bags weighing around 65 pounds a piece. That is over 100 pounds of soccer heaven for the kiddos. Thank you Lord, for getting all the uniforms on my flight to Addis Ababa for free. 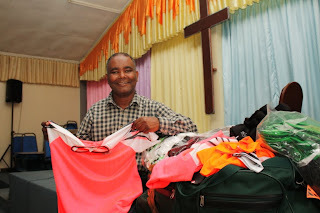 Now pray that customs in Ethiopia doesn’t think I am going to sell the new uniforms in the market so I can make the delivery to the church with the soccer club outreach to street children. With Ethiopian media and local officials watching, the water drilling team was at Bright Hope School finalizing the well depth measurements. The boring of the well for Bright Hope School will mean safe fresh water for the 2100 children who attend. It also will provide water for the chicken hatchery and garden that will be constructed quickly following the construction of the well. As the work on the fresh water well continues at the Bright Hope School, it is time to start funding the purchase of chickens, chicken feed, vegetable seed and gardening tools. With the completion of the well, the construction of the three chicken houses and the garden area will begin for the self sustaining mini-farm for the 2100 Bright Hope students and their community. One dozen chicks can be purchased for $35. Mothers who have lost their husbands, struggle daily to provide enough food for their children. 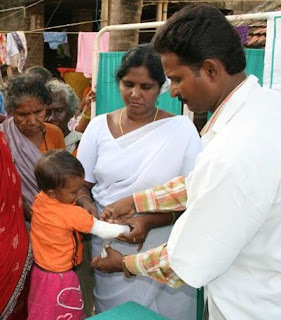 One of the most effective and satisfying projects for Children’s Hope India partners, is the mobile medical clinic. They set up in an area with no available medical care and watch mothers, with their children, quickly line-up to be seen by a doctor. Medicines are dispersed and even IVs given to those too weak to stand in line. 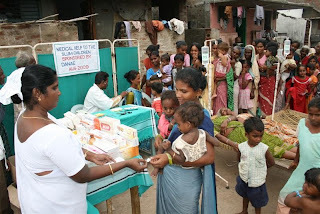 “Today CHI-India conducted a medical program where nearly 150 children received free medicine and treatment. 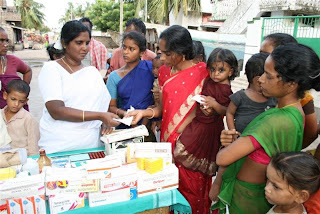 In the villages, especially in the fishing villages, the children are suffering with many kinds of health problems. 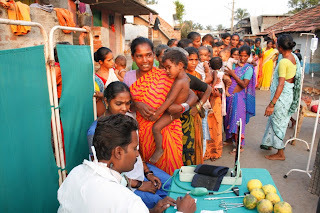 As I go to the streets, rural areas very often, I see their difficulties with their health,” said Paparao Yeluchuri. A mobile medical clinic, like this one held in late August, is made possible for less than $2 per patient. The data is taken from 2008 tax form 990. Listen to the passion of the two pastors, during a visit to Bright Hope, while they talk about the potential impact the Bright Hope project will have on the 2100 children at Bright Hope, as well as the community they all live. The work is just now beginning and we will need more people to join in to complete the project. Cute new photos from the Children's Hope Beijing Surgical Care Home. The Bright Hope School Garden project in Ethiopia, which will create a self sustaining chicken hatchery and vegetable garden within the grounds of a school for impoverished children, got its final approval yesterday. 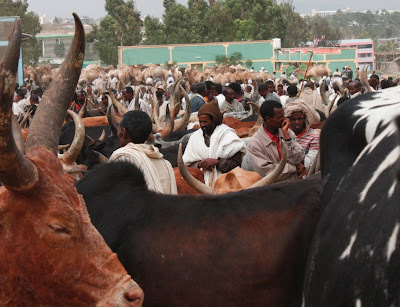 The Garden project has been in limbo for the past five months awaiting this final go ahead from officials at five different government bureaus in Addis Ababa. Boring, of the desperately needed water well for the school, of over 2000 students, will start immediately. Construction of the chicken coops, equipment buildings and the 1.5 acre vegetable garden will begin shortly after the well work is complete. 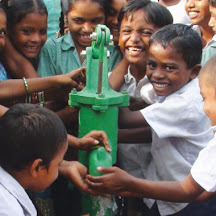 600 more families in Southeast India now have safe drinking water. Ethiopian children in the Children’s Hope Sponsorship program were filling up their new backpacks with supplies, as the beginning of school approaches. Each child received 10 academic exercise books with pens and pencils to go in their new book bags. Children in the child sponsorship program in Vinh Long Vietnam received additional education support as a new school year begins. 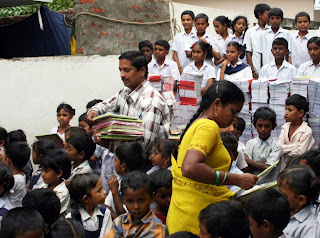 Each of the 142 children received one set of text books and several academic exercise work-books. This will give the children additional training in math, English, physics and chemistry. Children’s Hope staff is hopeful that safe fresh drinking water will be flowing soon for the Bright Hope School in Ethiopia. 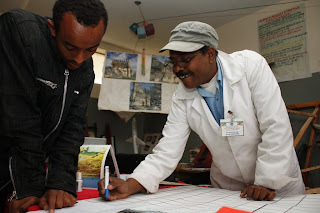 The approval of a well to water the crops and chickens for the self sustaining mini-farm proposed for the school in Addis Ababa is running a five month bureaucratic course. Several different government agencies were required to review and then approve the overall plan that will create an oasis of hope at the school of 2100 children who have lost at least one parent to AIDS or Leprosy. It appears this process is wrapping up. Fresh vegetables, eggs and chickens as well as safe cool water to drink are all but impossible to find in this forgotten community on the western edge of the city. Several churches and individuals have committed to help complete the $100,000 project. The children will not only be healthier, they will learn skills helping tend the garden and chicken hatchery. “No one has ever helped us like this before,” a Bright Hope school official said. You can help with the Rooster House and Garden. We are signing up Churches and community groups to bring a smile to a child by displaying an Orphan Tree of Hope . 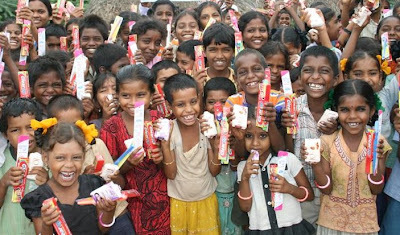 One of our loyal corporate sponsors, Candy Craze, turned candy into fresh sweet water for students in India. This month, the sale of their take-out boxes full of treats, also helped purchase school supplies for some of those same students.